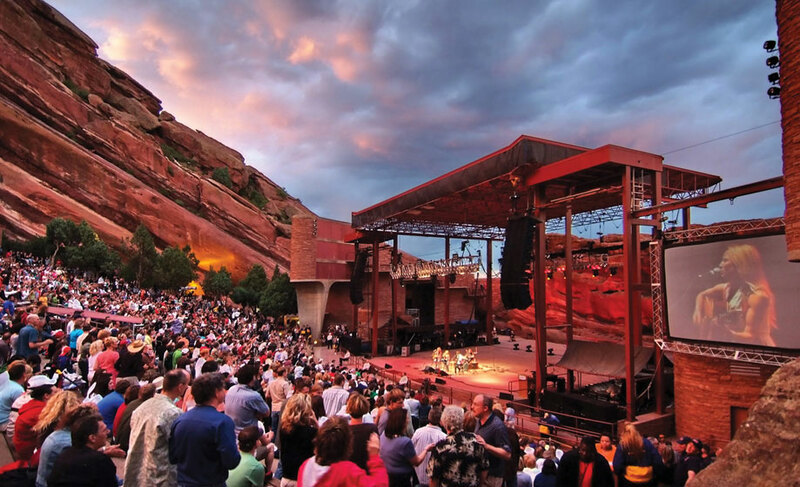 Red Rocks Amphitheatre just outside Denver and Golden in Morrison is one of the world’s most iconic concert venues, and nearly every Coloradan has a story about an epic performance they’ve seen there. We asked our Facebook fans to share some of their most memorable concert experiences with us. It’s probably no coincidence that our fans used the word “amazing” over and over. The venue’s otherworldly setting — the world’s only naturally occurring acoustically perfect amphitheater — attracts a huge number of incredible performers. Many people cited performances by U2, Widespread Panic, James Taylor, 311, The Eagles and Coldplay. So memorable, in fact, are Red Rocks concerts that many artists have released audio and video recordings of their performances there — Dave Matthews Band, The Samples, Incubus, The Moody Blues, John Tesh, Ricky Lee Jones, Rob Thomas, String Cheese Incident, Stevie Nicks, Boukman Eksperyans and Bill and Gloria Gaither, to name a few. One of the most famous concert videos ever released was from U2’s 1983 Under the Blood Red Sky tour, when a fully mulleted Bono belted out “Sunday Bloody Sunday” amid a hypnotic fog and rock formations festooned with massive flames. On your next trip, visit the Performers Hall of Fame to see images of other legendary performances, including The Beatles, The Grateful Dead and Jimi Hendrix. The amphitheater itself has released “Carved in Stone,” three compilation albums of star-studded, never-released performances recorded live at Red Rocks, including Blues Traveler, Stevie Ray Vaughan, Jack Johnson, Ani DiFranco, The Roots, Tori Amos, Ben Harper, R.E.M. and The Allman Brothers Band. All the albums sold quickly, but a few still pop up at independent record stores and online, and the fourth volume was released in 2012. The Red Rocks experience goes beyond the music itself. The iconic rock formations and position above Denver add a powerful mystique. Early-evening concerts are especially momentous, as the waning rays of a Colorado sunset frame the stage and paint the setting with pastel colors. “U2 before they were popular, I think it was ’82 or ’83. It was June and rainy and cold, but still the one I remember the most.” —John D.
“Each time I see James Taylor play Red Rocks, something amazing happens. During one show, a huge harvest moon rose up behind the stage. Another time it was raining during "Fire and Rain," and the crowd cheered each time he sang the word "rain." My favorite was when JT declared that there was no better place in the universe to play a show than Red Rocks.” —Gwen G.
“The Eurythmics, when Howard Jones opened for them in the early ’80s. It was my first concert ever … Got home really late and was late to school the next day!” —Julianna A. “I could never decide, although I suppose 311 and the Wailers in 2006 or 2007. It was just a time in my life that I really needed to see an amazing show with a peaceful happy vibe at the most beautiful venue in the world.” —Michelle M.
“Like most of you, I saw soooo many of the ‘highly acclaimed’ bands here. Loved those, but also loved the shows I saw growing up in the ’80s. Bands like Whitesnake, Stryper, Def Leppard.” —Jay L.
“I'm baffled that I'm the first to say this. But out of the 25+ shows I've seen at Red Rocks since moving here in ’05, I'd have to say that the respect and gratitude paid to Red Rocks and its surrounding land and people and the spirituality of the music that night would have to be John Butler Trio’s performance in 2010 … There’s just nothing like being front row surrounded by your friends and amazing musicians on a beautiful Colorado summer night! LONG LIVE RED ROCKS!” —Jen C.
“Any show is an epic show at Red Rocks. But one of my favorite moments was in 2003. It was Sunday afternoon of Widespread Panic’s three-day run. It had been raining all day and we were soaked and probably still a little trashed from Saturday night’s killer show. All the sudden JB busted out an acoustic rendition of Pink Floyd's ‘Wish You Were Here.’ The clouds parted and the backdrop of Red Rocks was a rainbow. It was friggin amazingly gorgeous.” —Heather M.
“My husband and I actually got married at Red Rocks this year on Valentine’s Day, so it’s not only our favorite place in Colorado but the place where our wedding took place.” —Erica C.
“Grateful Dead 1978, Santana many times. Too many others to name. No place on earth like Red Rocks.” —Lori L.
“Red Rocks rocks! Any event, especially 311. And the show for me would be 311, Pennywise and Long Beach Dub Allstars in Y2K. Tony Hawk was there bustin’ 1080s.” —Kyle C.
“1996 Weezer and No Doubt (back when No Doubt was a ska band). Pouring rain but still amazing.” —Luke G.
“I’ve seen 15 shows there, and honestly, it was probably Coldplay. Flurries in June, the sold-out crowd singing ‘Everything's Not Lost’ a capella — an amazing moment.” —Sarah P.
“Chuck Mangione! It was just beautiful and Esther Satterfield sang ‘Chase the Clouds Away.’ Bellavia and Land of Make Believe were beautiful, too.” —Tammy S.
“Hatchet Attacks was an amazin’ show. The view of the moon from the stands was amazin’. The sound was beyond perfect.” —Ryan S.
“The U2 concert in 1983. We sat in the rain all day hoping they would play. I can still see Bono singing ‘Sunday Bloody Sunday’ from the tower with his torch (fog, rain, fire). A-M-A-Z-I-N-G!” —Tom and Lisa M.
See upcoming shows at Red Rocks and become our fan on Facebook. Photo: Courtesy of Visit Denver, The Convention & Visitors Bureau/Steve Crecelius.